As a result of these bills, long lines and crowding at polling sites will hopefully decrease which could help increase voter turnout. DUSA has proudly been at the forefront along with other civic groups fighting for better voting laws in New York. Since 2015, we have gone to Albany every year to speak with New York legislators to advocate for these bills. We are excited to finally see our efforts reflected in the passing of these bills. This a step closer to our goal in making sure that every Dominican-American, as well as every U.S. citizen, can freely exercise their right to vote. Nevertheless, there is still much work to be done. Make sure to follow us on Instagram and Twitter @yosoydusa. And like us on Facebook, just search Dominicanos USA! This summer I have had the opportunity to be part of the SYEP program at Dominicanos USA. On August 1st we visited the Manhattan Borough president’s office. Deputy Borough President Aldrin Bonilla welcomed us and gave us a tour of the office. One of the very first things that stood out to me was the diversity of the team at the Manhattan Borough President’s office. The atmosphere gave us all a sense of both hope and inspiration for the future. Mr. Bonilla educated us on the importance of community, civic engagement and political involvement, all of which are part of DUSA’s mission. 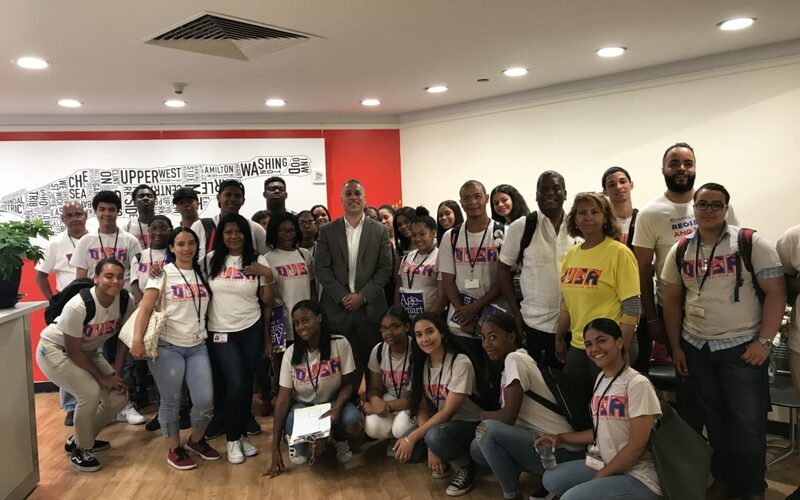 Not only were we able to engage with an influential Dominican-American like Mr. Bonilla, but we also learned about ways to play a more active role in the community. For example, anyone can apply to become a community board member at just 16 years of age. In other words, even if an individual is not allowed to vote due to their young age, they are still able to influence community decisions by becoming a community board member. Furthermore, Mr. Bonilla stressed the importance of giving back to the community. This helped me realize that as the future voices of our community, we must remember to strive for success but never forget the needs of the community that saw us grow. Some information about the Jerome Avenue rezoning: The City of New York is proposing a rezoning plan for Jerome Avenue in the Bronx, which encompasses all of Jerome Avenue between E 165th Street to the south and 184th street to the north; and also includes sections of Edward L. Grant Highway, E 170th Street, Mount Eden Avenue, Tremont Avenue, Burnside Avenue and E 183rd Street. All areas where a high population of Dominicans reside. In total this plan constitutes more than 70 blocks in the Jerome Avenue area. As of right now, the NYC Department of City Planning’s proposal consists of building a great deal of new residential units, but does not have any measures to protect current Bronx residents, most of whom are Dominican, from rising rent, displacement, or increased harassment from landlords that will most likely occur as a result the rezoning; neither does it outline how the resulting construction jobs will be regulated to make sure they are safe, well-paid, and for local residents; the proposal also doesn’t address the multitude of auto shop business that will be displaced and the hundreds of jobs that will be lost in the auto industry as a result of the rezoning. Why should Dominicans care? The Jerome Avenue rezoning would affect District 4 and 5 in the Bronx, a major residential area for Dominicans in New York. This proposal would not only give incentive for increased landlord harassment, it will most likely lead to increased rental prices in the area for residents and small business owners. In addition, the proposed rezoning forces the majority of Jerome Avenue auto shops–many of which are owned and operated by Dominican immigrant men–to leave without anywhere to go; therefore taking away a primary source of income for many Dominican men in the Bronx. All of these factors would make it even harder for Dominicans to live in the Bronx. Anti-displacement strategies for current residential and commercial tenants. Current tenants and small business owners will not benefit from the rezoning if the rezoning increases rents, speculation, and the forces of displacement. The City should take steps to ensure that the people and businesses that are here now are protected and are able to stay. Real affordable housing. All of the new housing built in the community should be at rent levels that reflect the need in the community. Good jobs and local hire. New construction and businesses will mean a lot of new jobs in the area and the City should guarantee that those jobs create career opportunities for local residents. Also, developers should not be allowed to build unless they commit to using contractors that are part of State Department of Labor Registered and Approved Apprenticeship programs. Safety and training. There recently has been an alarming increase in construction worker fatalities and life changing injuries in New York City. 18 construction workers died in the field from the beginning of 2015 to date. The City must mandate provisions for worker safety and training to ensure our most vulnerable workers are protected. Real community engagement. Residents need to have a say over what happens in the community, and the City should have long-term tools to ensure accountability for implementing commitments made during rezoning approval process, including a role for community in overseeing progress. The community needs this to ensure that the rezoning is actually part of a community plan that is effective and fully implemented. Attend monthly rezoning campaign meetings on the first Thursday of every month, from 6PM-8PM at 1501 Jerome Avenue, Bronx. There is food, childcare, and interpretation (English and Spanish). The next meeting on March 2nd will be a Town Hall on the state of the Jerome Avenue rezoning with elected officials, Council Members Vanessa Gibson and Fernando Cabrera. Sign this petition online and encourage others to do so. Attend Bronx Voices: Empowering Community in the Face of Rezoning, a community event showcasing Bronx visual and performing artists, as well as an open mic session for anyone to sign up and express themselves through song, story-telling, poetry, etc. The event will take place on February 25th at 5PM at 1501 Jerome Ave, Bronx. Keep up to date on the NYC Department of City Planning’s Jerome Avenue rezoning plan by visiting their website, along with events and rallies organized by the Bronx Coalition for a Community Vision. Together we need to find a way..
to move forward with the Jerome Avenue rezoning plan without displacement, exploitation, and harassment in the Bronx–a plan that benefits both current Bronx residents and new residents. Otherwise, we risk losing one of the last neighborhoods where low-income New Yorkers can afford to live and we risk losing the diversity and vibrancy of our City. Bronx resident and graduate of Vassar College. Katie is a member of Bronx Rising, a group that aims to get Bronxites to re-engage with their communities by creating spaces, dialogues, and events to re-awaken the love for their communities and focus on celebrations and issues that affect the people of the Bronx.